When the word comes in from Adele to "read this" you know there's no point in wasting time thinking about it, just order the book and be done with it. I think I may have just set a record with this one, recommended, ordered, arrived and read within less than a week. 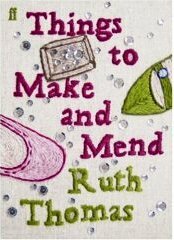 Things To Make and Mend by Ruth Thomas and published by Faber is an absolute must read for anyone who went to a girl's school in the 1960's and 70's, you will recognise every last thread of this book from the Domestic Science classes to the sadly outcast pregnant school friend. We had one or two of those back in the late 60's including one poor girl whose waters broke in the middle of the O Level English exam; that was a first and caused a bit of a stir. Schools like mine (old style girl's grammar) were still largely staffed by middle-aged spinsters with a smattering of the young and sprightly newly-weds who soon left us to the mercy of the "old school" to go and start their families.Of no relevance but amongst the "old school" a Physics teacher at least 6ft tall who played the double bass in the school orchestra and who we very unkindly nicknamed The GPO Tower. But back to Things To Make and Mend, Sally and Rowena are best friends until a devastating set of circumstances destroys the friendship and they go their separate ways. Sally, after enduring more of Miss Button's Needlework lessons than can be good for anyone's health, surprisingly finds that this is her metier and makes a living and then a small amount of fame out of her embroidery skills.Rowena's path ventures much further afield but it is inevitable that it will cross with Sally's again eventually. 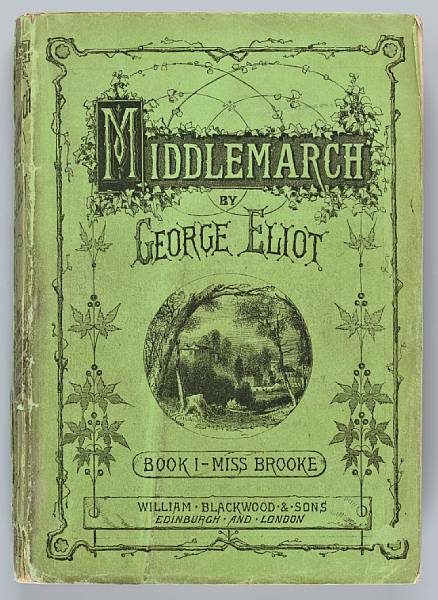 For me the greatest strength of this well written book was the nostalgia factor and with it a return to the Domestic Science room and tortuous lessons that turned what should have been a pleasurable occupation into a science. I suspect we were the generation of pupils in the mid to late 1960's living on the cusp of change and among the first batch not being solely educated for a life of domesticity. 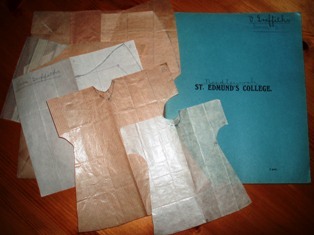 We were expected to set our sights at university but still had to be able to stitch a buttonhole.No one quite had the courage to dispense with or re-vamp the subject, attempts were being made to create a serious and examinable form of needlework and cookery out of something that had previously been purely practical. On reflection my books didn't look a great deal different to my mum's. 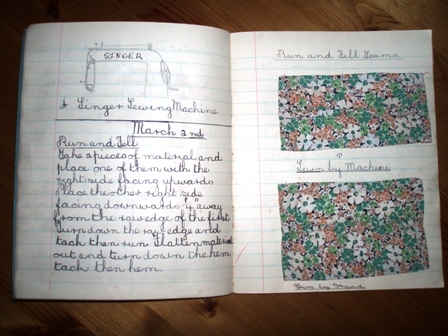 Here's her needlework book from St Edmund's College Liverpool, started in September 1938 when she was 12 so this entry March 1939. I think it's to my mum's credit that she managed to instill a love of sewing in me where school failed, a sewing machine of my own, the latest Butterick pattern and I was away with the bobbins. School needlework a la 1960's was like well thought out torture because you knew exactly what you'd like to knock up, perhaps a mini skirt or heaven forfend some hotpants, thus a whole term spent smocking a piece of gingham and then making it into an apron was a bit of a disappointment. Strangely though we were all wildly into knitting during break times (that and playing cards and swapping Jean Plaidy books), a very long scarf and mini-jumpers from a Paton's pattern modelled by Twiggy that took exactly 8ozs of Fiona wool were compulsory.At 2s 6d per oz.your jumper cost you £1. A really enjoyable read, thanks Ruth and thanks YET AGAIN to Adele for pointing me to A Dress A Day which almost makes me want to go and find those Buttericks. Do you remember buying those? Ladies with their specs on chains delving into those deep oblong drawers, big fuss about finding the right number and size and even bigger fuss about stamping it and telling you it couldn't be returned.